Figure A: Color flow Doppler ultrasound showing velamentous umbilical cord inserting into fetal membranes, 2.19 cm placental from placental disc for twin B in monochorionic, diamniotic twin pregnancy identified at 20 weeks gestation. 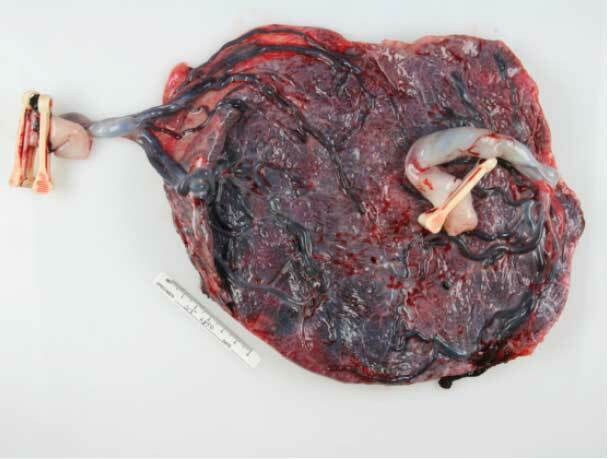 Figure B: Photograph of delivered placenta at 29 weeks. There was twin-to-twin transfusion syndrome with twin B, the donor twin. Note that there is a velamentous umbilical cord insertion (two umbilical cord clamps) belonging to twin B. The umbilical cord of twin A (one clamp) is inserted into the margin of the placenta. 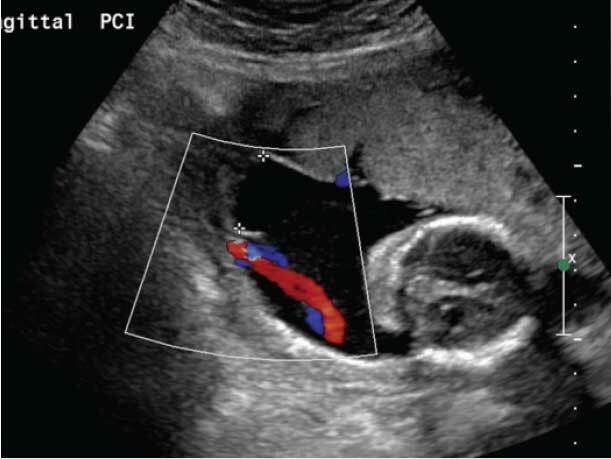 Early VCI detection triggers more careful prenatal fetal surveillance and may allow obstetricians to plan early delivery if needed to prevent VCI-related complications, such as fetal growth restriction or vasa previa. To determine the accuracy of ultrasound techniques to identify VCI, Dr. Curtin, along with colleagues Karmaine Millington, M.D., pediatric pathologist, and Jennifer Slough, M.D., former Penn State College of Medicine student, are conducting a retrospective analysis of anatomic ultrasounds with placental insertion site confirmed based on postpartum placental pathology. The Penn State Health Milton S. Hershey Medical Center ultrasound and pathology database is uniquely valuable based on its size and long history. The identification of the umbilical cord insertion site into the placenta by ultrasound has always been a required element of the fetal anatomy survey at Hershey Medical Center. National guidelines on imaging the umbilical cord insertion site into the placenta, until recently, had not listed this as a required element. Hershey Medical Center thus has a unique data set that allows correlation of imaging of the umbilical cord to the actual insertion site documented on pathologic examination of the placenta. Dr. Curtin notes, “Currently we use Doppler ultrasound, with color flow imaging. I think the cord insertion site is easier to locate with this technology, compared to traditional gray scale ultrasound.” (See Figure A) Identification of VCI depends on the techniques used, the training of the sonographer and the diligence applied in the performance of this part of the ultrasound exam. This raises the possibility that the incidence of VCI, currently at approximately 1 percent, may be grossly underestimated due to technological limitations. Moreover, not all institutions routinely perform a pathologic examination of the placenta in cases with no adverse pregnancy outcomes, and delivering clinicians may not document the placenta cord insertion site upon gross inspection of the placenta after delivery. “Thus, we currently have a gap in our knowledge of how accurate the assessment of VCI is on antenatal ultrasound,” says Dr. Curtin. In 2013, acknowledging the risks associated with VCI, the American Institute of Ultrasound in Medicine (AIUM) updated its guidelines to recommend documentation of the placental cord insertion site during the detailed fetal anatomic examination conducted at approximately 18 weeks gestation.² Hershey Medical Center ultrasonographers have always recorded placental cord insertion sites during fetal anatomic ultrasounds, and pathologists examine the placenta in all cases with a maternal, fetal or placental indication, placing them ahead of their peers in identifying VCI. Dr. Curtin believes that VCI may be on the rise, explaining, “As demographic shifts occur, with more women having their first child later in life and increasing use of IVF, the potential for more pregnancies involving VCI has also risen.” VCI is thought to be partially due to trophotropism. When the placenta initially implants lower in the uterus, it is necessary to grow toward more vascular areas, leading to the insertion of the cord becoming marginal or velamentous. When umbilical vessels insert onto the membranes, they have lost the protection of Wharton’s jelly, making them at-risk for injury. Risks of VCI are particularly increased among twin pregnancies involving monochorionic placentas (27.4 percent), compared to twins with dichorionic placentas (13.8 percent) or singletons (about 1 percent).1 In twin pregnancies with VCI, there are heightened risks of growth discordance and twin-twin transfusion (See Figure B). Dr. Curtin adds, “As the AIUM recommendations become more broadly adopted and applied, we expect VCI to be more reliably recognized.” The ongoing retrospective analysis informs health care providers how accurate ultrasound is in the identification of VCI and may provide insight into what can be done to improve its detection. RESIDENCIES: Anatomic and clinical pathology, Penn State Health Milton S. Hershey Medical Center, Hershey, Pa.; Obstetrics and gynecology, Fitzsimons Army Medical Center, Aurora, Colo.
MEDICAL SCHOOL: University of Pittsburgh School of Medicine, Pittsburgh, Pa. Ebbing C, Kiserud T, Johnsen SL, Albrechtsen S, Rasmussen S. 2013. Prevalence, risk factors and outcomes of velamentous and marginal cord insertions: a population-based study of 634,741 pregnancies. PLoS One. 8(7):e70380. American Institute of Ultrasound in Medicine. 2013. AIUM practice guideline for the performance of obstetric ultrasound examinations. http://www.aium.org/resources/guidelines/obstetric.pdf (accessed October 30, 2015).